Zigzagging along the Western Ghats, our jeep rumbles along the National Highway-206, connecting the coastal town of Kumta in Karnataka’s Uttara Kannada district to Jog falls. Suddenly, the vehicle screeches to a halt at a sign board that read Kathalekan (dark forest). I had been promised a sojourn in an ancient forest and was surprised to find only areca nut plantations at the spot. My guide M D Subash Chandran, a professor at the Centre for Ecological Sciences, Indian Institute of Science, Bengaluru, got down and started walking from the spot where the sign board stood like a mute spectator. I followed him and found a perfectly preserved instance of an ancient ecosystem deep inside. Kathalekan is a sacred grove nestled in a valley surrounded by hills, with the gurgling Sharavati river flowing close by. It is a relic forest spanning 25 square kilometres; its vegetation has not changed over a million years. According to Chandran, who has studied the region’s ecology for three decades, the grove has been preserved and worshipped for centuries, but there is no trace of the original devotees now. At present, it falls under the state reserved forest. We meet Ganpati Naik, a middle-aged man wearing a T-shirt and lungi, who performs rituals at a smaller grove nearby. Once a part of Kathalekan, it is now situated some 500 metres from the main grove, with plantations and farms dotting the landscape in between. According to Naik, his forefathers have been praying at the grove since ancient times. From nearby Malemane village, Naiks, Gowdas and Idiganaiks perform rituals in the smaller grove now. The presiding deities of Kathalekan are Chowdi (mother goddess) and Bhootappa (father god), along with Yakshi bana and Nagara bana. Devotees visit the grove during festivals from the nearby villages of Hejini and Mensi to pray to their ancestors. Three festivals are held here—Sankranti in January, Adri Mali in June and Diwali in October-November. Once, the entire southern stretch of the Western Ghats was covered with evergreen forests, including swamp forests. But there came a time when virgin forests fell prey to human greed. Cultivators felled trees and burnt stretches to clear patches for farming around 3,000 years ago. This changed the landscape completely. Currently, the total area under groves has reduced even though ancient tree species endemic to the region still exist in Kathalekan. One major reason behind this is the deep-rooted faith of local communities combined with water needs. 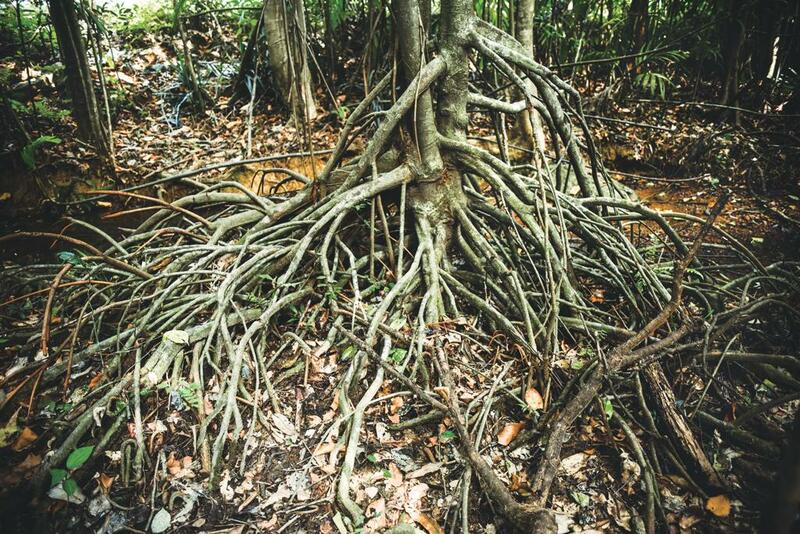 In Kathalekan, water flows perennially near the roots of Myristica trees, a genus of wild nutmeg, found in Asia and Western Pacific. These trees are characterised by stilt roots that grow obliquely above the ground and help in respiration, toxin removal and transpiration. Myristica is found in swamp ecosystems and is the oldest flowering tree on Earth. Other tall trees like the endangered gurjan (Dipterocarpus indicus and the critically endangered kere neerilu (Syzy-gium travancoricum) also dominate the place. The dense vegetation is home to a rich diversity of flora and fauna. “There are 35 species of amphibians in this area. 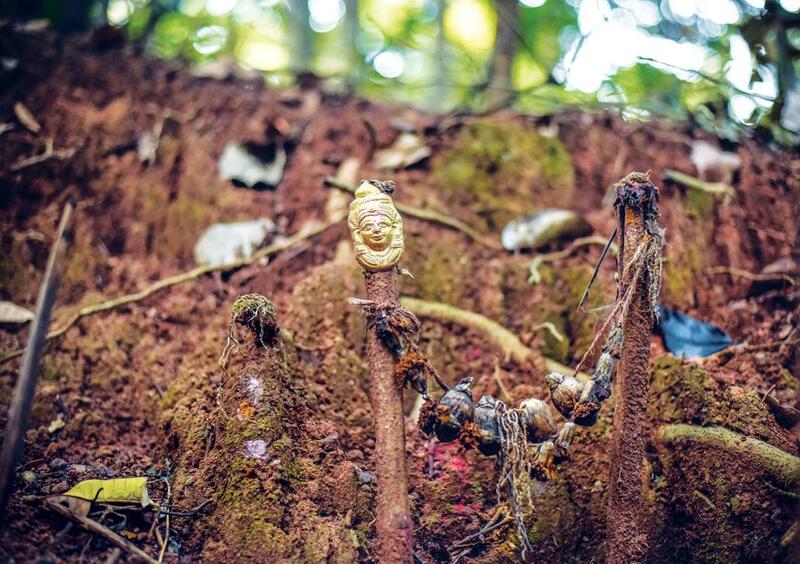 Kathalekan also harbours 185 flora species, of which 109 are trees, 39 shrubs, 12 herbs and 25 climbers,” Chandran adds. Apart from old species, new ones like the Semecarpus kathalekanensis, a relative of the mango, is also found. It was first reported as Semecarpus travancorica by state officer G S Mathuda in 1953. However, it remained unknown until the 1990s when Chandran observed it during one of his visits. Botanists later established it as a separate species endemic to Kathalekan, after studying its morphology in a research paper published in the journal, Indian Forester, in 2000. Later, molecular analysis of the tree by Gudasalamani Ravikanth, a botanist working at the Bengaluru-based Ashoka Trust for Research in Ecology and the Environment, supported this theory. It is surprising that such a rich eco-system has survived for centuries so close to a national highway. But the trees in Kathalekan have learnt to adapt themselves to their surroundings. For example, Myristica trees have a thin, moist bark and large leaves, which help them in getting rid of water easily. This has helped the tree survive. “The ecosystem is at its most evolved state now due to the elimination of unfit species,” says Chandran. He, however, warns that Kathalekan is fragile and any major changes in the ecosystem, especially in the water system, will lead to devastation. This is already happening due to excessive water usage by farmers in the uphill regions where rice and areca are cultivated. In the absence of swamp water, the entire ecosystem is bound to collapse. A gradual shift in faith from sacred groves to temple-based gods can mar conservation efforts. This was observed in some groves near Siddapur town. In Elakundali, situated in Sagar Taluka of Shimoga district, a grove spread over six hectares has a temple dedicated to the deity of Rajeshwari Bhootaraja. Originally, people from Kumbre caste used to worship her. Local belief is that the goddess came to reside here due to disturbance in Bandige village, her original home. According to the head priest in Elakundali, 68 pujas are performed at the temple annually. On the occasion of Danda puja, a local festival held in the end of April, the temple hosts 5,000 devotees for whom a feast of sweet dishes is arranged. Though there is no restriction on the entry of devotees from other castes and religions, women are not allowed close to the deity. Cutting of trees is allowed only during ceremonies. The presiding deities in Kalyanpur and Mattigar groves near Siddapur are Chowdamma (mother goddess) and Jetiappa (father god); the third deity is Keriamma and Veerappa respectively. In both these places, stones have been placed to mark the deities’ places. Now, the local community is taking initiatives to build temples inside groves. According to some, this will mean significant changes. Mitashree Srivastava, assistant professor of anthropology at the University of Delhi, says in such places “the culture of the grove might have been replaced by the construct of power which induces a fear of the gods”. This is the reason why local people fear the wrath of gods in cases of theft. Priests vouch for the punishing power of the deities. In Kalyanpur, locals believe that those who steal from the grove suffer bad luck, ill health and sometimes even meet with accidents. “Community members have imposed restrictions on the removal of fuelwood, fodder and useful non-timber forest products. It is to prevent the exploitation of these resources,” says Jagannatha Rao, associate professor at the Institute of Trans-Disciplinary Health Sciences and Technology (TDU-FRLHT) in Bengaluru. TDU-FRLHT is trying to quantify the ecosystem services provided by groves in Karnataka. It is considering both tangible and intangible services like hydro-logical security, availability of medicinal herbs and biological diversity. At present, it is awaiting approval from the Union environment ministry. Already, people are knowledgeable about greater water availability in regions where sacred groves abound. Priests in both Kalyanpur and Mattigar affirmed that water was available even during the dry season. “As a step towards conservation, TDU-FRLHT is encouraging local communities to construct fences and put display boards near sacred groves,” Rao says. To prevent the entry of stray animals, the forest department has dug trenches around the groves. It is fascinating how sacred groves like Kathalekan survived till date in the midst of disturbances. During the British era, communities lost control over sacred groves as these were not identified separately. They were merged with reserved forests, according to a research published in the journal, Bioremediation, Biodiversity and Bioavailability (Special Issue I), in 2010 by Chandran and his colleagues. This continued post-Independence as well when forests were cleared in many places for development projects. But deep community faith has preserved ones like Kathalekan even today. Will sacred groves be an obvious choice for conservation in future?